When it comes to hiring a telescopic forklift in London, you will need to have a good idea of your requirements in order to make sure you end up with the right machinery. Whether it is the first time you have hired a forklift truck or you simply need to brush up your knowledge, check out our guide to telescopic forklift hire in London below. Telescopic forklifts are often required to carry out jobs that a basic forklift would struggle to do. Why hire a telescopic forklift truck? London businesses hire telescopic forklift trucks for various different reasons. Many of our clients actually hire machinery from us during busy periods when customer demand is at its highest. Others hire telescopic forklifts when they have special jobs that need to be carried out that their existing machinery is unable to complete to a satisfactory standard. Although businesses always have the option to buy a telescopic forklift, many simply cannot justify the cost, especially if they will not be using the machinery on a regular basis. Instead it makes much more sense to hire a telescopic forklift as and when they need to. Not only is hiring machinery much more cost effective in many cases, but it also prevents companies from having to worry about storing the machinery and accounting for the cost of maintenance. As we mentioned before, it is a good idea to brush up on your knowledge of the different types of telescopic forklifts, so you end up choosing the right piece of machinery to suit your operations. Of course, if you are still unsure after reading this next part of our guide, you can always get in touch with a member of team who will be able to provide you with additional advice! Telescopic forklifts come in a wide range of sizes and have various different lifting ranges. The telescopic forklifts in our fleet have lifting ranges from 500 kg to 10,000 kg. 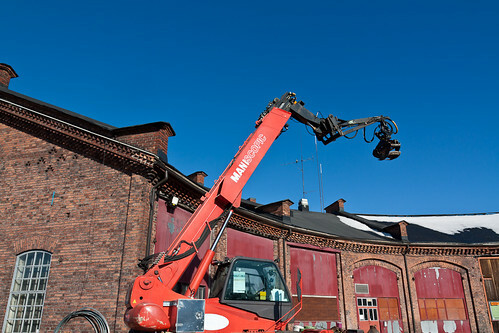 The telescopic booms can also vary in size, so it is important that you not only choose a forklift with the right lifting capacity but boom length too. Electric telescopic forklifts are designed for indoor use only. When it comes to choosing a telescopic forklift truck, you first need to establish whether you plan on using it inside or outdoors. If you are looking for a forklift truck that can navigate tough terrains outside, we recommend hiring either a counterbalance gas forklift truck or a counterbalance diesel forklift truck. If however you are looking to hire a forklift truck to use indoors, you will need to hire an electric forklift truck. These forklifts do not produce the same harmful emissions as diesel and gas forklifts and are therefore safe to use inside. Electric telescopic forklift trucks are cheap to run and are also very quiet, so they are unlikely to cause any disturbance to your staff at work. No matter where you hire a telescopic forklift truck from in London, it is important to make sure that the machinery is health and safety compliant. Here at Hiremech, we carry out regular inspections and maintenance on entire fleet to ensure that each piece of machinery is up to the necessary standards. We have all of the important paperwork on-site as proof of our compliance. When hiring a telescopic forklift truck from a London company, it is worth enquiring about the various different attachments provided. If you have used a telescopic forklift before, you will know that you can fit one of several attachments onto the end of the boom. These attachments include everything from buckets, to pallet forks, muck grabs and winches. Each attachment is designed to help forklift truck users carry out different tasks. Pallet forks are one of the most popular telescopic forklift attachments requested by our clients. They can be used to move loads from one place to another. Pallet forks are particularly useful for placing items in areas that regular forklift trucks are unable to reach. Whilst companies could use a crane to carry out this task, cranes are much more expensive to hire and are also the least practical option. When hiring telescopic forklifts, make sure you find out whether the attachments you require will be included in the price or whether they will need to be hired separately for an additional charge. Before agreeing to hire a forklift truck in London, it is important to make sure you are clear on the hire terms. Telescopic forklift truck hire terms vary from one company to the next. Whereas some companies specialise in short term hires others will let you hire out their machinery for longer periods of time. Here at Hiremech we offer pretty flexible telescopic forklift truck hire terms. By that we mean that we can either hire the machinery out to clients on a short term or long term basis. Whatever suits their needs is fine with us! We also offer immediate hire options, which is useful for companies that are on a tight schedule or are having trouble with their own machinery. All of our telescopic forklift trucks can be hired with or without a driver. You must have a licence to be able to drive a telescopic forklift. Whilst on the topic of drivers, it is important to remember that only an individual with a telescopic forklift truck licence must operate it. If you do not have an employee that has a telescopic forklift qualification, you will need to hire a driver that does. This is something we can help you with. When it comes to hiring a telescopic forklift truck in London, remember to do your research and identify your requirements so you stand the best chance at securing the best piece of machinery in your price range. Always hire from an established rental company, like Hiremech and check that their machines are health and safety compliant. If you have any more questions about hiring telescopic forklifts or would like to know more about our fleet, please get in touch with a member of our sales team.